that the Sikhs are a minority in the country itself. A delegation of students, today met the deputy commissioner, Bathinda, with their demands related to the clash between the police and ITI students here on Wednesday. The Punjab government would make concerted efforts for the preservation of river water and would not allow even a drop of water to go out of the state, irrigation minister Janmeja Singh Sekhon stated, while listening to the problems of village panchayats here today. To provide free treatment and medicines to tuberculosis (TB) patients in their native towns and villages, the Indian Medical Association (IMA) has joined the Punjab Health authorities for the Centre’s Revised National TB Control Programme (RNTCP) and to begin with, the IMA’s Punjab unit has initiated the move to sensitise private doctors in Muktsar district. The Lok Sabha Deputy Speaker Charanjit Singh Atwal today expressed serious concern over female foeticide and said that education of girls was the only answer to this social malady. The second day of the three-day free health camp at the civil hospital here saw a mixed response to it. On the third day of the of the 10-day NSS camp, organised by SSD Girls College, training was imparted in yoga to NSS volunteers. Marriage accompanied by a grand party is a dream for most bachelors but the ‘doli’ has a special place for the bride. Freedom fighter Dr Mukand Lal Bhandari passed away here this morning. He was 93. Chief Judicial Magistrate B.R. Garg sent Kulwinder Singh, guard of the Chur Chak railway crossing, on judicial remand till January 1, here today. Some army officials have also come under the scanner in the infamous fake arms licence scam that was unearthed in the neighbouring Sriganganagar region, sources said. The maiden meeting convened by the deputy superintendent of police (DSP) Parampal Singh to launch the community police officer (CPO) programme saw a low presence of municipal council members here. The Punjab State Human Rights Commission (PSHRC) has directed the department of education to get the boundary wall and a room constructed in the oldest educational institution here, the Government Senior Secondary Adrash School for Boys, besides ensuring basic amenities within three months, sources confirmed today. About 2,539 government primary middle schools and 15,000 teachers have been working in an uncertain condition for a long time. To promote peace and communal harmony, a yagya was organised at Shri Lal Bahadur Shastri Arya Mahila College Barnala here today. The old students association of the Nehru Memorial Government College here organised an annual function today. The two-week camp of the Panjab University (PU) girls kabaddi team concluded at the Guru Nanak College for Girls here today. Deputy Speaker of the Lok Sabha, Charanjit Singh Atwal today said that the Sikhs are a minority in the country itself. So, it would not be improper to say that the decision by the High Court on the minority status of the Sikhs was lacking in facts and figures. “What is painful is that with the implementation of the order, Sikhs will lose all the privileges related to being a minority class,” he added. Atwal, who was here in Bathinda today to attend the annual function of a private school, also expressed concern over the condition of education system. He said that rural education in Punjab has collapsed. It can be uplifted only with the co-operation of the other states and asked the union government to pay attention towards improving the system. He blamed the previous government in Punjab for not paying attention in this regard. When told that Sarv Sikhya Abhiyan has not been providing the expected results, he termed it as a matter of shame and assured that he would discuss it with the Centre. “The union government must bear the expenses of education as the state government faces funds shortage. If the burden is to be shared by the state only, then the expectations will always be difficult to realise,” he added. The Lok Sabha deputy speaker also regretted that hooliganism in the assembly or parliament is relished by some people. “But I have no regret in saying that the people, political parties and the media also are responsible for it,” he added. Atwal also blamed the criminalisation of politics for the weakening of institutions. “The best way to tackle this is that if any party gives ticket a person who has a criminal background, then he should be thrown out in the elections,” he pointed out. On the issue of additional powers given to the defeated candidates of the ruling party by creating the new post of ‘Halqa in-charge’, he parried the query saying that the ruling party must respect the winning candidates even if they belong to the rival party. The delegation, through a memorandum, demanded that strict action should be initiated against the transporters and police officials involved in the incident and bus pass facility for students should be applicable on all buses. When contacted, deputy commissioner Rahul Tewari said, "The students have submitted a memorandum and a meeting between the students and the general manager, PRTC, has been planned for Wednesday in this regard. I hope the matter will be resolved soon." While talking to The Tribune, Sekhon elaborated on the biggest ever irrigation scheme of the state recently unveiled by CM Parkash Singh Badal on December 8 from Bathinda on which an expenditure of Rs 3,243 crore would be incurred. Sekhon said the scheme would benefit 6,000 villages of the state and would cover 28.68 hectares of the agricultural land and in the process around 70 lakh farmers of the state would be benefited. Sekhon said this revolutionary scheme embarked on the SAD-BJP government would ensure 30 per cent increase in the capacity of the canals so that the water could reach up to the tail-end. Sekhon further informed that an amount of Rs 1,043.93 crore would be spent on strengthening and relining of canals. Likewise, an expenditure of Rs 1,583.41 crore would be incurred on the construction of 16,282 km long drains and Rs 308. 50 crore would be spent on the improvement of the existing minors. The minister said Rs 239.50 crore would be spent in the Malwa belt alone for various flood protection and water logging measures. About the Hansi-Butana canal issue, Sekhon said the Central Water Commission CWC) had raised strong technical objections on the digging up of river by Haryana. He said the Punjab government had lodged a strong protest against the same, and the entire case along with the facts and repercussions pertaining to Hansi-Butana canal was brought in the knowledge of the commission. Sekhon said after serious protest to its construction, the CWC had sent a technical team led by its chief engineer A.K. Bajaj to survey the canal under-construction, and later, after considering view points of Punjab, Haryana and Rajasthan governments, the CWC would release its report. Talking about the ramifications of this canal, if constructed, Sekhon averred that hundreds of villages belonging to Patiala alone would get submerged under water. Sekhon said river water distribution was an inter-state issue, so Haryana alone should not have started constructing such canal at its own level. He said the state government had mooted a proposal to construct Dashmesh canal for irrigational facilities in Fathegarh Sahib, Mohali and Ropar districts by diversifying water from Bhakra dam, however, the same was rejected by the union government. About remodelling of channels in the UBDC system, Sekhon said the same had already been completed at a cost of Rs 177.80 crore to meet revised water allowances as a result 1.18 lakh hectare of the agricultural land had been benefited in Amritsar and Gurdaspur districts alone. Sekhon said the government had also taken up the project for converting Banur canal system from non-perennial to perennial at a cost of Rs 58.15 crore which would benefit 36,022 acres of land in Patiala. He said the government had also formulated a scheme to install 510 tubewells in various blocks at a cost of Rs 126.87 crore. The minister further stated that Than Dam in Kandi area of Hoshiapur had been completed in the record time at a cost of Rs 28 crore, and the same would be commissioned soon. He added that government had also decided to construct 9 more dams including Nar Dam, Arniala Dam, Rantatwali Dam, Mohan Majra Nighi, Haripur Dam, Chak Sadhu Dam, Bachoi Dam, Takarla Dam and Sukkar Suha Dam which would serve dual purpose of flood control and irrigation in the backward Kandi area, and at the same time it would improve socio-economic status of inhabitants also. The union government had in October last identified six states: Punjab, Haryana, Chandigarh, Maharashtra, Andhra Pradesh and Bihar, for private participation in its programme, after observing that 40 to 50 per cent of the TB patients still went to the private doctors for cure, of which, 1,000 still die every day in the country. 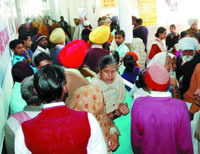 The private doctors could take their one-time consultation fee under the programme before referring the patients to the nodal centres where they would be getting free treatment and medicine throughout the period of treatment under the IMA-GFATM-RNTCP programme, said Amrit Sethi, the IMA’s Punjab unit president. “Our aim is that the patients need not walk more than a kilometer for the cure of TB even if they reside in remote villages, and the involvement of private doctors and other volunteers for this cause would help a great deal,” he said. At least seven doctors in Muktsar town alone had expressed their willingness to join the TB programme and the IMA has got an encouraging response in other small towns as well, said S. K. Jindal, the RNTCP Muktsar district coordinator. “The essential element of RNTCP, based on the WHO’s ‘Directly Observed Treatment Short Course Chemotherapy (DOTS) model, included political commitment, passive case finding, diagnosis by sputum microscopy, treatment under direct observation, uninterrupted supply of drugs, individual patient registration and a follow-up and outcome evaluation by the health department. Under this special drive across the state, there are 57 TB units (TUs), 283 Designated Microscopy Centres (MMCs), and 13,884 DOT centres under this programme, which has also been providing free X-ray examination for the sputum positive patients. Female education was a more effective tool to curb female foeticide than ‘vasectomy’, he said while speaking at the annual day function of Sri Guru Harkrishan Public School here. Atwal who was chief guest at the function to mark the 20th anniversary of the school said that education of girls was very important as educating a girl child means educating the entire family. Exhorting the students to serve the humanity without any bias, Atwal gave the example of Bhai Kanahia who used to offer water to every dying person, irrespective of the fact whether he was a Hindu or Muslim. When Guru Gobind Singh asked him why he was offering water to everyone, he said, “I see your image in every person,” Atwal said. ‘This is the spirit which must reflect in every human being’, he said adding that the Red Cross movement was also inspired by the spirit of service to mankind. Earlier, the function, which started with the recital of Shabad Bole So Nihal and a welcome address, got off to a colourful start with students presenting an impressive cultural programme. A captivating puppet show, followed by Arabian ballet and Punjabi folk dance depicting the customs, traditions, culture and heritage of Punjab were the highlights of the day. A fascinating fashion show, absorbing English play and pulsating folk dances, bhangra by tiny tots, left the audience mesmerised. Highlighting the achievements of the school, H.S. Sandhu, honorary secretary, trust and school management, said that apart from excellent academic results, the students of the school have excelled in sports, cultural and other activities. Speaking on the occasion, principal Jaswinder Singh said hard work and determination is the key to success. In his message, guest of honour, DIG, Faridkot range, Jitendra Jain asked the students to remain focused. Some sarpanch from the area apprised Atwal of the activities of Christian educational institutions and alleged that they were luring poor people to convert by offering free education. While doctors were euphoric over the number of OPDs organised, some of the patients were found lamenting that it would mean economic burden on them too. Giving the details, civil surgeon Maninderjit Singh said, “The fair has evoked a response that exceeds expectations. As per the details provided by the civil surgeon, 527 persons have attended counselling for various national programmes, a total of 269 lab tests have been done, 175 ultrasound tests and 482 x-rays have been conducted during the first two days. The details further indicate that ECG has been performed on 206 patients, 252 persons have visited for blood group tests and 30 cases of papsmear have come up. The civil surgeon said that the psychiatry OPD saw 232 people come for help while 282 persons attended counselling for de-addiction. On the other hand, patients were found saying that the medicine being given at the fair was just for three days. After that, they would have to buy the same medicine at the print rate from the market. A patient, standing at the medical stall at the fair, alleged that the medicine being given was of generic quality, which is priced higher. So after the camp, it would mean a huge burden on poor patients. The trainer, Radhe Shyam, demonstrated the points to be kept in mind before performing yoga and also exercises to help prevent obesity, joint pains and other diseases. In the second lecture session at the camp, Satnam Singh Jassal explained the relationship between books and students. In the third lecture session, Raj Gupta, principal Swami Vivekanand College made the NSS volunteers aware about HIV/AIDS and also encouraged the students to donate blood. From being carried by bearers on their shoulders in the good old days, to being brought in luxurious and fancy cars, the ‘doli’ has come a long way. Now, they are decorated with the choicest of flowers and eye-catching items. This tiny town located in the close proximity of its more developed cities, Ludhiana and Jalandhar, could not resist to follow in their footsteps. People here have developed a penchant for hiring 28-feet long limousine for bringing a doli. Although the phenomenon was in vogue in Ludhiana and Jalandhar earlier, it was introduced here hardly a few years back. Hardeep Singh, who owns a limousine and a Mercedez Benz, informs that he charges Rs 10,000 for bringing a doli in a limousine with travel not exceeding more than 50 km. A pioneer in introducing the concept here, he learnt about it in Ludhiana. He procured the 1988-make used 28-feet long car at Rs 12 lakh. Besides, he also possesses a Skoda and a Mercedes. He purchased a used Skoda and Mercedez for Rs 8 lakh and Rs 4 lakh, respectively. Tastefully decorated and white in colour, the 28-feet long car is a treat to watch on the road. Singh says that the demand for the car increases with the arrival of the marriage season and adds that with the festival of navratras, the demand picks up and slows down near the summer season. Pomp and splendour during marriages has become synonymous with the Punjabi culture. The practice is another facet of the way people here splurge on marriages. Born in 1914, Bhandari had been in the Indian National Congress both before and after the country’s independence. He had been the old Ferozepur District Congress Committee general secretary and the president of the Muktsar Municipal Council. Escorted by the personnel of the Government Railway Police (GRP), Kulwinder was presented before the court at noon. He claimed, in a chat with the reporters, that he was not present at the crossing at the time of the accident. He said he had gone to the market to fetch medicines. He also claimed that it was another person who had opened the gate. According to the information available, the administrative inquiry committee constituted by the district magistrate was of the view that some army officials, through middlemen, had sold weapons in the open market. And the district authorities even issued the licences for the same despite knowing that the weapons were listed in the prohibited category. Senior army officials had reportedly decided to order a probe at their level into the matter in October last and there were reports that the officers had been directed to get physical verification of the weapons as well as licences issued to them in the past failing which they would not be allowed leave. Interestingly, the Army had sought information in this scam about 73 licences whereas the district authorities had identified only 43 cases. It was believed that the probe by the Army had brought forward additional cases, sources added. From being a poet to a student union leader, from a theatre artist to a lyricist and now a film director and singer! It’s a journey undertaken by Amardeep Gill, one of Punjab’s lyricists whose songs have always left a mark on the minds of people. He would soon be directing a Punjabi art movie based on the novel ‘Kallari Dharti’ written by Baldev Singh ‘Saraknama’. Next month, he is also releasing an audio album, whose songs would be sung by Amardeep himself. ``I have been associated with theatre since my college days. It was my dream to direct a Punjabi art film and now I feel it is the right time to do so as Punjabi cinema is flourishing day by day. The script of the movie is ready and it would be produced by a Canada-based NRI. Leading theatre artists of the state would feature in it,’’ Amardeep informed. A Punjabi album with ten of his songs is in the offing. ``Whenever I give my song to any singer, I select the composition, record it in my voice, and then give it to the singer along with the written song. Every song is written with a specific thought and it is the lyricist who knows the best composition for his song. Now, I would be coming up with an album in my own voice by the end of the next month. The recording has already started at Delhi and some of its songs have been recorded,’’ he said. Since only three members out of 31 attended the meeting, it spoke volumes about the elected representatives’ concern for the problems of this sub-divisional town. The DSP claimed that all the municipal councillors had been invited but only three namely, Vimal Thathai, Manpreet Singh and Vijay Nagpal, spared time to attend the meeting. “If the councillors are not aware, how can one expect awareness among the common public,” he asked. Claiming that the CPO programme, a brainchild of the DGP N.P.S. Aulakh, had shown encouraging results, the DSP did not mince a word in conceding that the police here was unable to check the spree of thefts as some of these incidents had reportedly occurred in broad daylight. He said persons, aged between 20-40 years, would be employed under the CPO programme to keep a watch in different residential areas and markets. “Their remuneration would be contributed by the residents and shopkeepers. Besides, local police officials will also be prompted to intensify night patrolling,” Parampal said. The DSP claimed that the police had achieved 80 per cent success in checking drug trafficking in the area while lottery speculation and other gambling dens had been wiped out during the past few months. He agreed that junk dealers were to be equally blamed for the spurt in incidents of thefts as some of them purchased stolen manhole covers and other metallic substances from the habitual offenders at throwaway rates. He asked the city police officers to convene a meeting of the junk dealers and warn them against doing so. The members of the commission had expressed concern over the denial of basic amenities, including drinking water and toilets, besides non-existence of the boundary wall. Interestingly, sincere efforts made by the school principal Ajinder Singh and staff have yielded fruits during the last quarter of the year even when the department did not release any funds to improve the condition here. Some senior functionaries of the ruling political parties had come forward in providing the students and teachers with basic amenities. Ram Kumar Goyal, a former BJP MLA, today inaugurated the drinking water system in the school. He along with SAD (B) Balluana circle president Jathedar Kaur Singh, SGPC member Kartar Singh Sidhu, local SAD (B) president Sukhwinder Singh, councilor Vijay Nagpal, former councilor Harcharan Singh Pappu and the Kundan Lal Santosh Jasuja Trust had contributed Rs 31,000 for the noble work. Kaur Singh said he passed his higher secondary from this school in 1973 but its condition had deteriorated during the last three decades whereas other institutions had made tremendous progress. He and Goyal assured to arrange funds through the Lok Sabha member, Zora Singh Mann, and the state government. Ajinder Singh said toilets too had been given a new look by removing all bottlenecks. An NSS camp under the guidance of lecturer Parwinder Singh was in progress to give a face-lift to the school grounds. According to the Punjab Government’s Education Policy 2002, these schools are running only with three classes VI, VII and VIII. The schools have no permanent posts of school heads and school in-charge do not have the power of withdrawing their salaries. The Save Education Committee (SEC) of Mansa demanded that the schools be merged with high schools so that village students could study till matriculation. Another solution is that the schools be merged with primary schools by launching a full-fledged elementary directorate. They said by this step, the dropout rate would decrease. On the occasion, a new Mahvidyala yagyashala was also inaugurated for performing the havans. Giving this information, college secretary Bharat Bhuhan Menon said that in the Vedas, the organisation of yagya is must for the peaceful existence and purification of our soul and environment. Achrya Naresh, a Vedic speaker, while addressing the audience said that the Arya Samaj had played a pivotal role in women’s education, to curb the social evils and for the freedom of the country. He said it was Maharishi Dayanand Sarswati, the founder of the Arya Samaj who worked for women education in the country. For this purpose, the first girls school was opened in Haryana by the efforts of Swami Dayanand. He also raised his voice against social evil-Sati Pratha. In this way, it helped the society a lot. He further said that people mistook Arya Samaj as a particular religion but it is a sort of revolutionary movement which is aimed at working for the social upliftment by eroding social evils. Surinder Singh Gulshan, a religious singer, sang various songs that enthralled the audience on the occasion. On the occasion, some old students of the college, who went on to attain eminence, were honoured. Those honoured on the occasion included former head of English department Acchru Singh, Darshan Mittal, Sukhpal Sharma, the editor of the Aaj Di Awaj, Baljit Singh Brar, Jagjit Singh Chahal, former MLA Harbant Singh Datewas and Ishwar Goyal, among others. Balwinder Singh Bundher, leader of Srimoni Akali Dal and chief guest at the function, praised the honoured former students. While addressing the gathering, he said that the state government was trying to raise the level of education. He also announced a grant of Rs 12 lakh for setting up a computer laboratory in the college and Rs 50,000 for the association. Principal Kulwant Kaur Sandhu thanked the gathering for their presence. The president of the association, Gurpreet Singh, assured that he would make every effort for the college’s welfare. Different teams presented cultural programme on the occasion. It was held ahead of the North Zone and the All India Inter-varsity Kabaddi championships beginning at Solan in Himachal Pradesh on December 24. Panjab University could not reach the All-India category last year, as they had lost to Guru Nanak Dev University and other strong contenders from Kurukshetra University and Himachal University, Shimla, in the North Zone category.